WebRanking is once again proud to be a sponsor of Ignite Portland, now in its 11th session. What is Ignite Portland? Each presenter gets 5 minutes on stage with 20 slides that automatically rotate after 15 seconds. 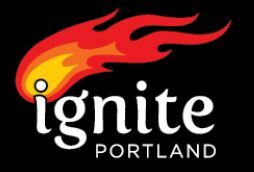 This event isn’t limited to just Portland, as Ignite events can be found all over the world. However, Portland has a long running tradition of putting on amazing Ignite events, with some of the most creative, informative, thought provoking and down right off the wall presentations out there. Which is why we have been a continued sponsor for the past 3 Portland Ignite sessions. Ignite Portland 11 is going to take place on Wednesday September 19th at the Bagdad Theater. This is a free event, but if you are interested in going, make sure to get there early as seats fill up quickly. For more information about the event, and a list of the scheduled speakers and their presentations, visit IgnitePortland.org. I had the honor of presenting at MnSearch’s 1st Search Snippet event on “Landing Pages and Conversion Rate Optimization” on Thursday July 26th 2012, in Minneapolis. Here is the Slideshare from my presentation entitled “The Past, Present and Future of SEO Landing Pages“. When I opened my browser this morning (Google Chrome FTW!) 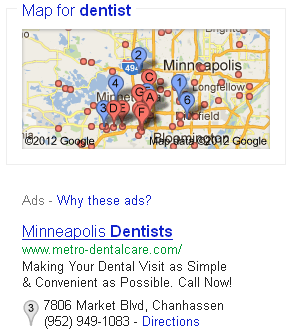 and did a search on Google, I noticed that the Search Engine Result Page layout was quite different. I tried a couple searches to verify that it wasn’t a glitch in the matrix, and sure enough, I was seeing the new SERP with all my searches. The additional links have moved from the left side of the SERP to the top, leaving a lot of extra space on the right side of a normal SERP. Could this mean expanded ads? That we won’t know for a while, but it does give more room for the page previews. In keeping with Google’s habit of conducing AdWords SERPs tests on Fridays like the left side search tool test, the Olympic Logos test, and the “Related to” Ads Segmentation test, another unique test was spotted today for their Image Search pages. This test appears to be for SERP combinations with and without standard AdWords PPC Text Ads, as well as with product listing ads for searches that appear to be related to ecommerce products. The following screen captures show some of the combinations that were spotted today. 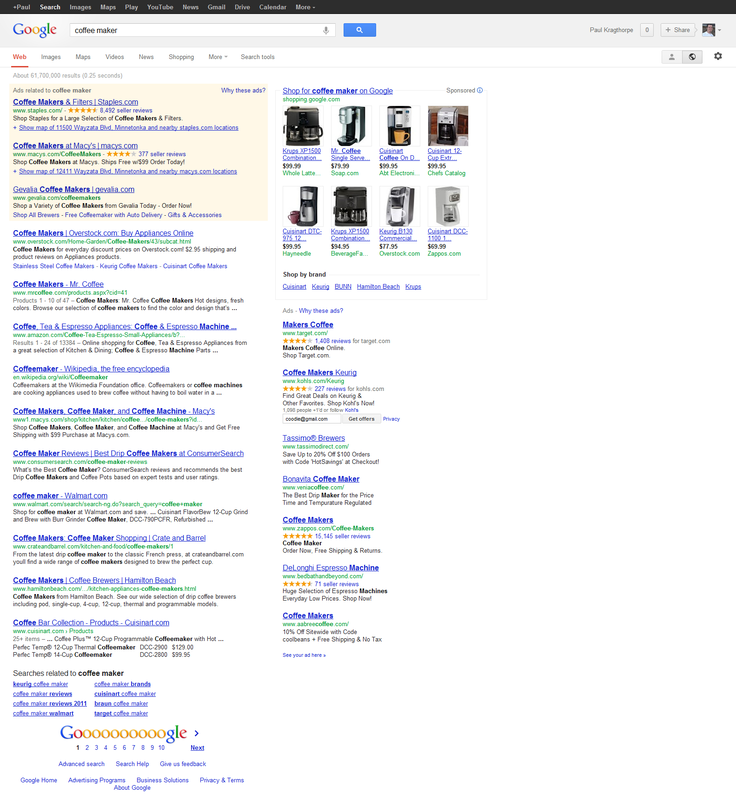 This SERP contained both of the Google AdWords ad formats for Product Listings and Text Ads, with the Top 2 Text Ads loading a couple of seconds after the rest of the page did. That delay caused the product ads and images below to appear to “bump” down. Facebook Ads - Are They Right for Your Business? Yes, Facebook is a big deal. You use it. Your kids use it. And to your chagrin, your Mom and Grandmother are on “the Facebook” now too. With almost 900 million (yes, that is MILLION…Dr. Evil) users, you also know that a significant number of your potential customers are also using Facebook. And despite the recent IPO concerns, plummeting stock prices, and GM publicly stating that Facebook Ads don’t work, I’m here to tell you that yes they do indeed work, and that there are countless businesses out there that are profiting from their Facebook ads. In fact, with the recent IPO, Facebook now has an even greater need to maximize revenues and will certainly be focusing more and more on their paid advertisements. This should lead to better integration, better management tools and increased visibility for your ads. Over the past few years Google has been implementing small, but significant, formatting and functional changes to their search result pages, as well as the release and upgrade of several ad extensions like the Location Extension shown in the image to the right. 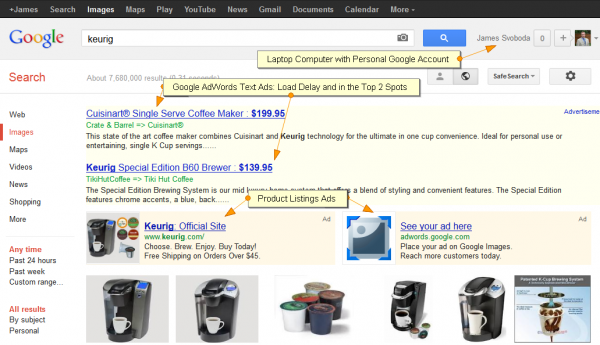 A) To create a more unified experience for users between the organic search results and pay per click ads. B) To blend the look, format and function of the free and paid listings so that searchers can have a hard time making the distinction between them, thus reducing their ability to choose between which type of listing they would like to click on. Basically, tricking surfers into clicking on the higher listed ppc ads more often than the organic “free” listings that Google generates no revenue from. The truth probably lies somewhere in between. WebRanking	1998-2019 WebRanking, All Rights Reserved. Sign up to stay up to date on the latest digital marketing news, trends and strategies.